Is there a 'best time' to see the Northern Lights in Iceland? There are only a couple things you need to see the northern lights - dark skies, and an active sun. The Sun, in periods of high activity, frequently spits out large volumes of very energetic particles. If these particles are aimed towards the earth (or more precisely, where the Earth will be in a couple of days) then our Earth’s magnetosphere - which is a magnetic shield against precisely this kind of thing - and these particles must collide with each other. Most of these particles will be redirected around the Earth - their paths will simply be bent by the magnetic field to move them away from the planet. However, particles that come close to the top of the planet can get caught. Near the magnetic poles of our planet, the magnetic lines that normally run parallel to the surface turn and sink into the surface. This creates a divot in the magnetic shield, and particles can get stuck in there, like bits of leaves in an eddy. 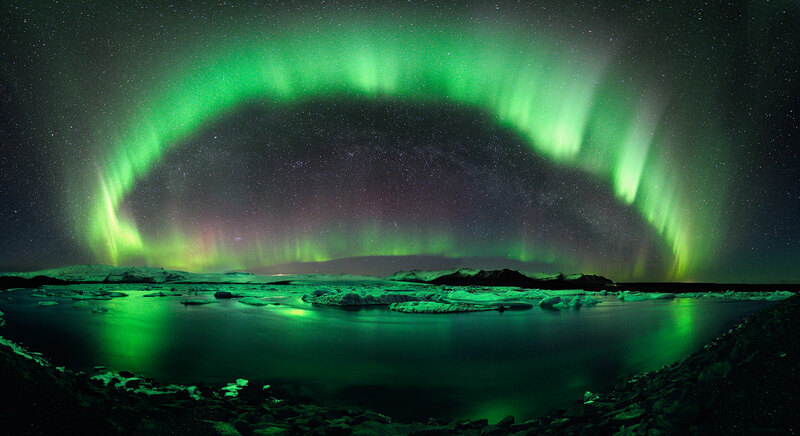 The solar particles then run into bits of our atmosphere, and make it glow, lighting up the skies with the aurora. So how do you optimize your chances of seeing the aurora? Since it’s a glow, it’s always easier to see when it’s quite dark. Now that the Northern Hemisphere is entering fall, the nights will begin to lengthen, which also lengthens the amount of time they might be visible. The other thing that helps is being near to the magnetic poles - the closer you are, the weaker the aurora that will still be visible. Similarly, bright storms will look even brighter if you’re further north. It takes a very strong storm to be visible further south than the 45th parallel, but in Iceland you’re very close to the Arctic Circle, so your chances (geographically speaking) are pretty good. The last ingredient is an active sun! We are currently in solar maximum. This means that the sun is as active as it gets right now. The sun goes through solar maximum every 11 years, after which point the magnetic field of the sun flips, resets, and the sun goes quiet for a while. The sun will gradually become more active again over the following 11 years. So your best chance to see the aurora in iceland is right about now! If you keep an eye on a site like SpaceWeather, or if you see something in the news about a solar storm or a coronal mass ejection headed our way, that’s the best time to head outside and watch for the Northern Lights.